The UFC traveling to Madison Square Garden each November has quickly become one of MMA’s best traditions. 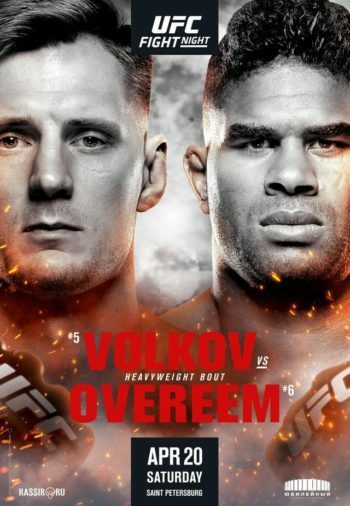 Often one of the best cards of the year, UFC at MSG is reserved for the biggest and best fights possible. 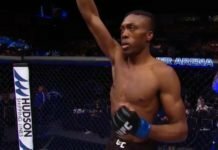 So, who could the promotion call upon to headline UFC 230 this fall? In recent years, the likes of Conor McGregor and Georges St. Pierre have fought in the main event of the promotion’s annual visit to Madison Square Garden. Three title fights featured on each event as well, leading us to believe there will be more of the same headed our way in November. Needing to improve their pay-per-view numbers, a stacked card for UFC 230 is a great way to head into 2019 and the new deal with ESPN. The event has several great match-ups announced already. The middleweight division will be highlighted throughout the event, with eight of the top-ten fighters in the division currently slated for UFC 230. 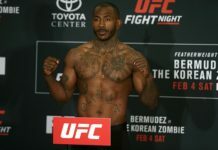 Apart from champion Robert Whittaker and his next challenger, Kelvin Gastelum, the top-tier of the promotion’s 185-pound weight class will be on display. 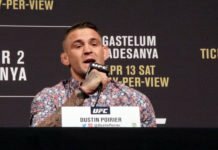 Oh, and Nate Diaz is slated to return against the hottest lightweight around: Dustin Poirier. With that much action on the card, the promotion needs the proper main event to top it all off. There’s also two pay-per-views scheduled for December of this year, and they’ll have to make sure to leave something for Toronto and Las Vegas. So, what’s left for the biggest pay-per-view of the year? As mentioned, Robert Whittaker won’t be fighting at UFC 230 this fall. He’s out until 2019 after suffering another injury in his rematch with Yoel Romero in June. Luckily for Whittaker, a fresh contender (or two) will be wanting a shot at the belt following all of the middleweight action at MSG. A couple of title bouts will be happening at UFC 228 in September. We’ve seen crazier things than a champion fighting twice in a couple months, but don’t expect that to happen this fall. Headlined by Tyron Woodley’s title-defense against Darren Till, bypassing alleged interim 170-pound champion Colby Covington, UFC 228’s main event likely rules out the winner for another defense in November. As for Covington, he apparently has Kamaru Usman’s full attention. We can count out whoever emerges from Nicco Montano’s first women’s flyweight title-defense against Valentina Shevchenko, too. They’ll fight in the co-main event of September’s PPV, and wouldn’t exactly fit atop of UFC 230’s loaded card. There’s also some stuff happening at UFC 229 you might’ve heard about. That’ll probably rule-out either Khabib Nurmagomedov or Conor McGregor from returning to main event UFC 230. Then again, MSG always seemed like the proper landing point form McGregor’s return. 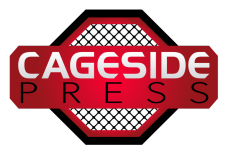 Unfortunately for the promotion, a thin group of champions to draw from has forced the biggest fight in MMA today to their October pay-per-view in Las Vegas. 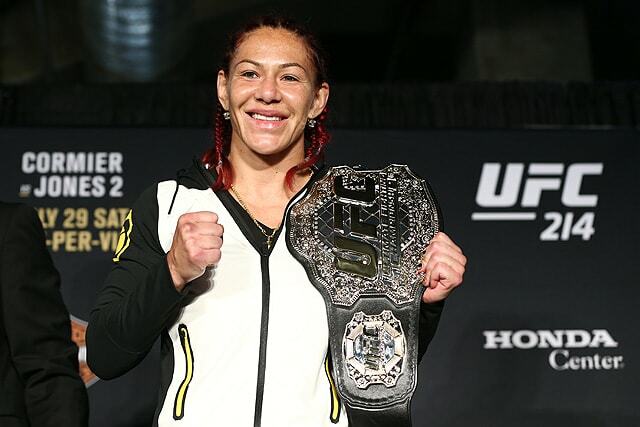 It looks like champions Cris Cyborg and Amanda Nunes will be busy for the final few months of 2018 as well. Reports surfaced in July about a potential December bout, likely headlining UFC 232 in Las Vegas on the 29th. Cyborg is annoyed with Nunes for apparently delaying their bout. Whenever it happens, Cyborg-Nunes for the featherweight title is one of the bast matchups the promotion can currently make. But it looks like it won’t be happening at MSG in November. Strawweight title-holder Rose Namajunas could be available for her second career fight at MSG. She planned to take time off after accumulating some injuries in her run to the 115-pound championship. As much as the promotion is waiting for Namajunas, they need a fresh contender for the champ as well. Former champion Joanna Jedrzejczyk has had her shot, and now it’s time for a mew challenger. Apart from JJ, Jessica Andrade is the highest ranked contender. The Brazilian is 5-1 since moving to strawweight, with back-to-back wins, and is slated to take on the last person to defeat Namajunas: Karolina Kowalkiewicz. 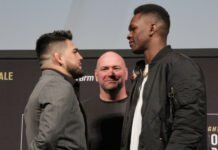 That match-up is expected to be featured at UFC 228 in September, giving whoever wins a fairly quick turnaround for an early-November title-shot. Even then, it’s hard to imagine either turning the opportunity down, should it be presented. It’s also hard to imagine a strawweight title-bout main eventing the biggest UFC PPV of the year. A superfight on the other hand? That could do the trick. Alright, the situation is pretty funky. But, the promotion needs a big fight, and the situations at flyweight and bantamweight are less than straightforward. 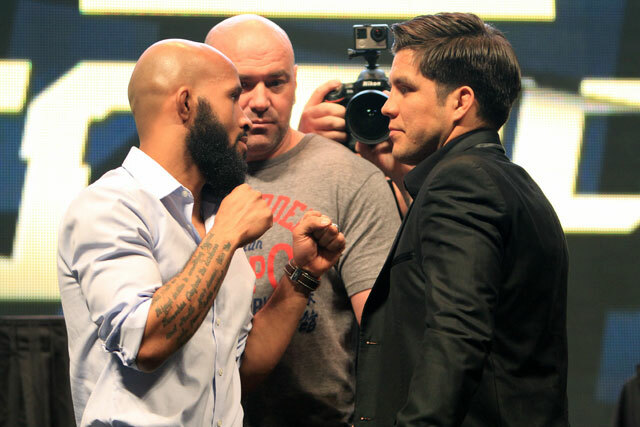 For new 125-pound champ Henry Cejudo, a rematch with the legendary Demetrious Johnson is the obvious next step forward. The reasons Mighty Mouse deserves an immediate rematch are numerous, but the reasons that may not happen aren’t hard to understand. Johnson is hurt, potentially suffering a broken foot and damage to his LCL in his fight with Cejudo. That makes a rematch at UFC 230 unlikely, and puts Cejudo in a tough spot. The rematch with Johnson is obvious. But apart from that, there’s not much in terms of worthy contenders at flyweight. Sergio Pettis lost to Cejudo in December, and Joesph Benavidez is booked for a bout with Ray Borg at UFC Denver the weekend after UFC 230. Of course, Cejudo could be patient. Waiting for either Johnson or Benavidez to be ready, and for the promotion to make the call, makes sense. But maybe parlaying the biggest win of his career into a superfight with 135-pound champ TJ Dillashaw is the move for Cejudo to make before the year is out. There’s a similarly cloudy picture atop the bantamweight division. 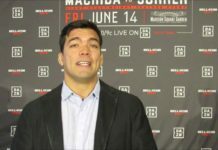 Dominick Cruz would like to return from his lengthy layoff with a title shot, Marlon Moraes is a human highlight reel, and Raphael Assuncao is one of the hottest fighters in the division. Cruz (1-0) and Assuncao (1-1) have fought Dillashaw in the past, but Moraes is the fresh face making waves at 135-pounds. Realistically, any of those options work for Dillashaw. Cruz and Moraes in particular sound entertaining. Despite Assuncao having previous wins over both the champ and Moraes, his lack of notoriety, and the way he looked in his last bout with Dillashaw, likely hurts his chances at a trilogy bout. So, making Cruz and Moraes figure out who gets the title-shot sometime soon sounds like a fun idea. But that’d probably shelve Dillashaw for an extended period of time. Given the number of pay-per-views (and title-fights needed for those events) on the way, we’re expecting at least one more Dillashaw bout in 2018. If Cejudo and Dillashaw are available and willing, and the promotion is game, Dillashaw-Cejudo wouldn’t look out of place as the UFC 230 main event. 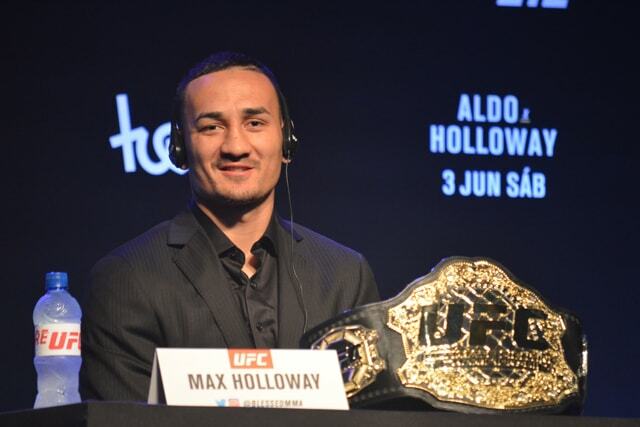 Oh yeah, there’s that Max Holloway-Brian Ortega featherweight title fight we’ve been waiting for. 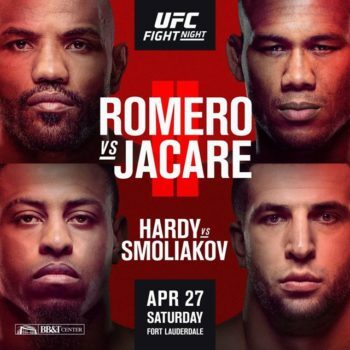 It’s anyone’s guess when Holloway will be ready to go, after the Hawaiian was pulled from his short-notice bout with Khabib Nurmagomedov at UFC 223 and his matchup with Ortega at UFC 226. 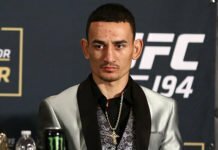 Holloway says he’s confident he’ll be good-to-go by the end of the year, and his fight with Ortega could easily fit atop UFC 230. If Holloway isn’t available, an *gulp* interim title-bout between Ortega and either Frankie Edgar or Renato Moicano doesn’t sound terrible. Let’s just hope it doesn’t come to that. Daniel Cormier might also be an option. But, for which division? All signs are pointing to Brock Lesnar making his promotional return against Cormier in 2019, but it’s unknown if that means he won’t attempt to defend the belt before then. Stipe Miocic has recently made some noise about an immediate rematch, and we wouldn’t necessarily argue. With the lack of depth at the top of the heavyweight division, giving the longest-reigning champion in heavyweight history a rematch at Madison Square Garden wouldn’t be a crazy move. 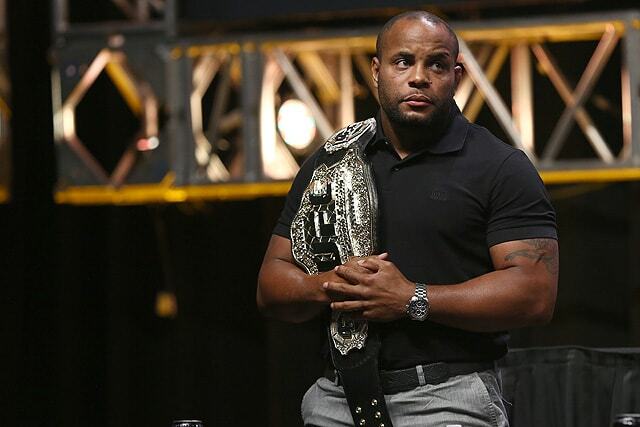 Instead of worrying about that, Cormier could attempt to defend his light heavyweight championship. Unfortunately, like several other divisions, the 205-pound weight class lacks a clear number-one contender. Cormier has shared his feelings on a bout with Alexander Gustafsson, the current #1 contender in the official (and also sometimes very stupid) UFC fighter rankings. 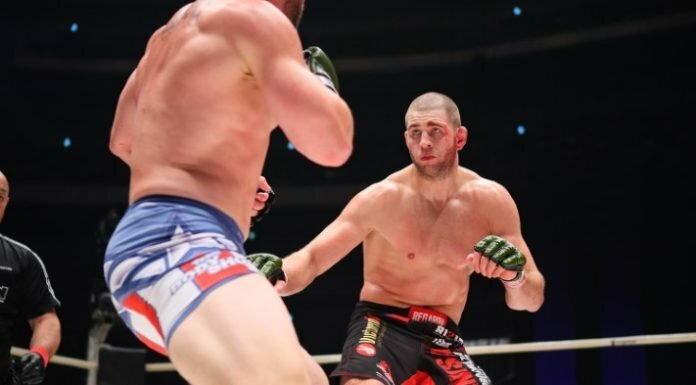 After Gus, Volkan Oezdemir and Ilir Latifi have the strongest arguments. 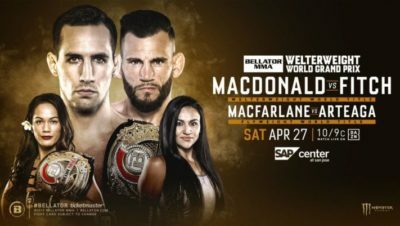 The problem for Oezdemir, apart from scheduling him bouts, is that he lost to Cormier earlier this year. He’s also scheduled to fight Anthony Smith in the main event of UFC Moncton in late-October. While Latifi has won his last two bouts, he’s only fought once in each of the last two years. He’s also lacking a marquee victory, making his claim for a title shot all the weaker. We mustn’t forget about Georges St. Pierre. 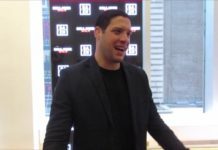 The two-division champion and former Madison Square Garden headliner recently threw his hat into the ring, angling for the winner of Nurmagomedov-McGregor at UFC 229. UFC President Dana White has played down that possibility, which means it’s probably going to happen. 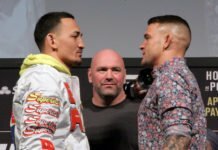 White also mentioned that Toronto, which hosts UFC 231 in December, makes sense for GSP’s return. The promotion’s tug-of-war with St. Pierre is nothing new. Niether is the Canadian’s drawing ability. He’s proven to be one of the biggest attractions in the UFC, and regardless of when and where he returns, St. Pierre will draw in viewers. While that’s likely to happen before the end of the year, UFC 230 in New York doesn’t seem like the proper landing place. 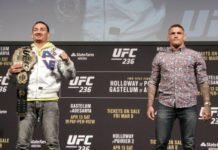 With St. Pierre probably waiting for what happens in the main event at UFC 229, and a super-fight between Cejudo and Dillashaw unlikely, we’re betting on Max Holloway defending his title against Brian Ortega being the main event of UFC 230. Given the surprisingly impressive stable of available options, we’re expecting the promotion to make their event at Madison Square Garden one of the best of 2018. Let us know who you think will be fighting in the main event at MSG, and who you want headlining UFC 230! Comment below, on Facebook, or reply on Twitter!